Does not use Denuvo Anti-Tamper DRM. Configuration are stored separately in the Settings.ini and Settings.sav files. 10 autosave slots available. Active autosave slot can be changed at any time during gameplay. Steam Cloud files are secondary and only updated on changes. In-game anti-aliasing may cause visual issues. Cutscenes, menus and loading screens are 16:9. Backgrounds are 21:9. Choice of two presets, only difference is swapped fire button. XInput locks out mouse-based input. 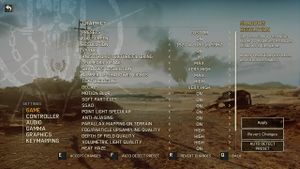 See Helix Mod: Mad Max. Color corruption may occur if a program other than Windows manages the systems color profile (e.g. f.lux) and the game is run in fullscreen. Play the game in windowed or borderless fullscreen mode. WBPlay has issues with Linux 4.9+, causing serious stuttering in Mad Max and Middle-earth: Shadow of Mordor. Feral is aware of the problem and looking for a fix. Play the game with Steam in offline mode. This prevents a connection to WBPlay and stops the stuttering. Every time the game auto-saves (which is very often), the game hiccups. This happens when the save gets written to the Steam save data location. Prevent the game from saving to the Steam save data location. Go into Properties of the 'remote' folder, open the Security tab and deny write access for all groups/user names. Auto-saves will continue to go to your Documents folder. The Feral Launcher requires libidn version 1.33 in order to work outside Steam Runtime mode, check if the Linux distribution has it in their repository, normally it would include the version number or a compat highlight, sometimes even both (Such as libidn-133-compat in ArchLinux's/ArchLinux based distro's AUR). If it is not present, it is possible to compile one from GNU's page, which also includes the instruction manual and commands that can be copied & pasted. Bear in mind that you should use sudo command when you wish to install the compiled library. A much safer option is to use the LD_PRELOAD environment variable in Launch options if you fear that it may replace the recent version of libidn, after you have compiled but not installed it. as superuser/root if the package is not present. 1.0 In BETA. Password to access the beta branch is livelongandprosper. Linux only. Nvidia graphics cards require driver version 367.35 or newer. AMD and Intel graphics cards are not officially supported. ↑ Primary support page for Denuvo Anti-Tamper offline activation. Secondary support page which can be used in case of troubles with the primary one. 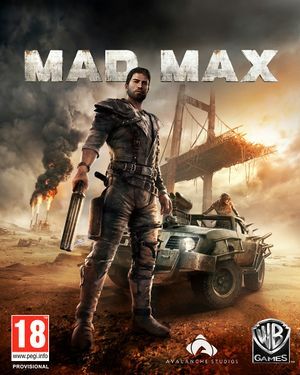 "On October 20th, enter the outlandish post-apocalyptic world of Mad Max on Mac and Linux." "As the game got added to Origin, it longer contains Denuvo." Confirmed myself by removing the offline token file and blocking access to revalidate.wbgames.com. This triggered the typical Denuvo offline activation prompt. Different from other protected Steam titles is that the offline token is stored in the \Steam\userdata\<user-id>\234140\dbdata file. Verified using the Steam version. Seems once upon a time the game had Steam Input API support, but it was removed in an update.